One of the easiest ways to spruce up a boring dorm room is by dressing up the bed. But pillows, bedsheets, and a pretty comforter only go so far when it comes to overcoming sleep problems. 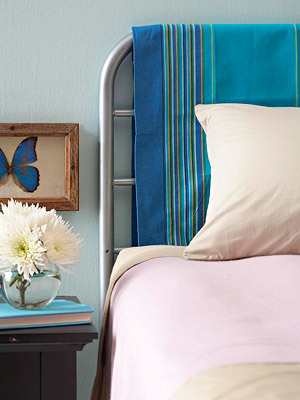 Here are some diy headboard ideas so that you can give your dorm bed a little extra ooomph! 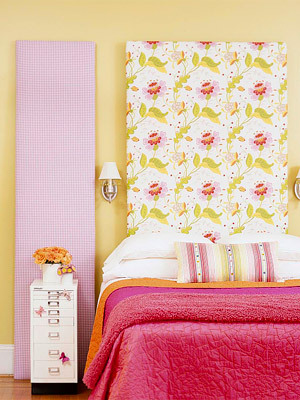 Above: For this "Tall Order" headboard featured at BHG (Better Homes & Gardens), an inexpensive artist's canvas was covered in fabric and propped behind the bed. I particularly like this project because the canvas could be re-covered if you want to change you color scheme or it could moved around the room if you no longer wish to use it as a headboard. I do think, however, that it should be fastened to the wall in some way to avoid falling on your head during sleep. Some kind of adhesive hooks might just do the trick? 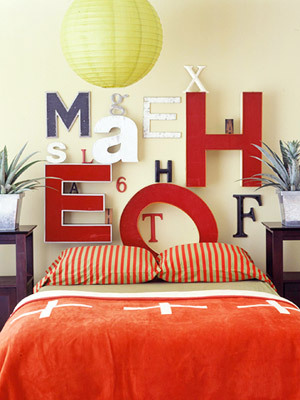 Above: This "Letter Perfect" headboard shown on BHG is dedicated to all you bookworms and future novelists out there. Collect new or vintage letters of varying sizes and colors flea markets, antique shops, and craft-stores... and put 'em up on the wall with some double-sided tape, poster putty, or adhesive hooks (depending on the material and weight of your letter). 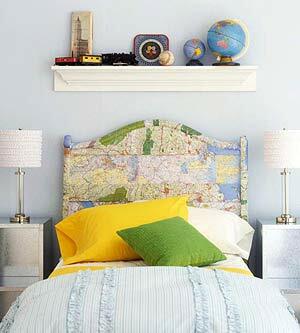 Above: Hey, globetrotters... you may like BHG's "Map Quest" headboard project. Simply use decoupage medium to adhere paper road maps to an old headboard. (Note: Do not, under any circumstances, decoupage the dorm-provided headboard... it will damage the school's furniture.) For a dorm-safe approach I would recommend either doing this to a headboard you own and bringing it to school... or decoupaging a flat piece of plywood and temporarily attaching it to the headboard the school provided you with. Above: Add some timeless romance to your dorm by borrowing the "Screen Star" idea from BHG. Simply place a folding screen between your headboard and the wall. Wrought iron is always gorgeous, but there are a variety of screen available out there. Plus, a vertical screen will draw the eye upward. Above: BHG's "Perfectly Padded" idea is a new take on the old upholstered headboard. I absolutely adore this idea. Simply hang a bench cushion by it's ties from wall-mounted hooks. I think those adhesive hooks are pretty much ideal for this project. (Just make sure that they are all attached to the wall at the same level so that your cushion isn't crooked.) You could also put a twist on this diy by hanging the cushion over the long part of your bed instead of at the headboard. 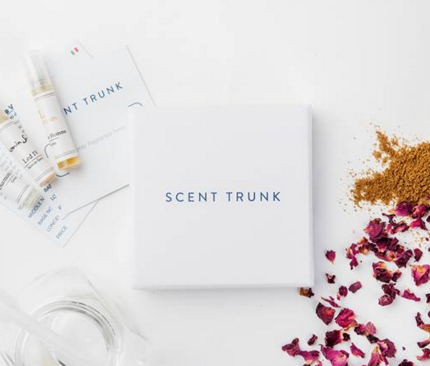 It could give your bed a daybed like. 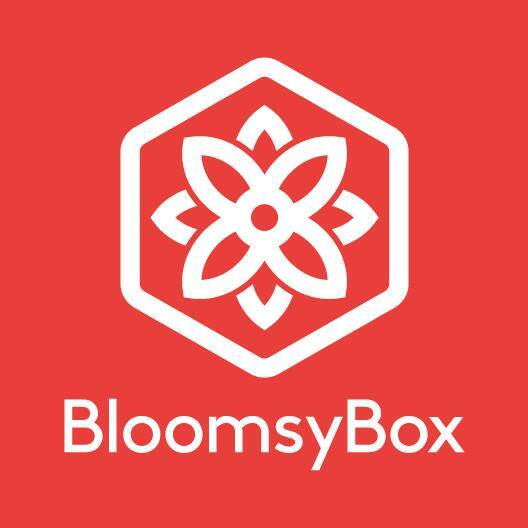 Above: Isn't this BHG project pretty? This "Elegant Illusion" also happens to be a piece of cake. While you're not allowed to paint the walls at school, vinyl decals are a great alternative. I'm sure if you shop around you'll be able to find a vinyl headboard decal. Or you could stick other decals to the wall and create your own idea of a headboard. I think one of those chandelier silhouette decals would be quite eye-catching over a bed. 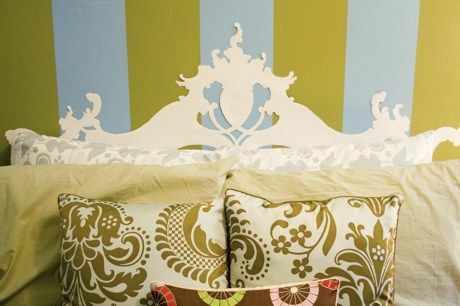 Above: So this BHG idea, called "Pop of Color", is the easiest, most convenient, and easiest headboard project. 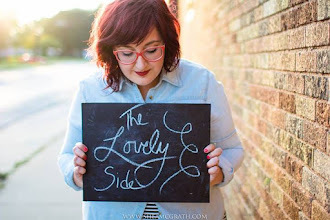 So if you're not crafty, on a small budget, or simply change your mind a lot... give this diy a chance. Simply drape a panel of fabric over the headboard. Then tuck the ends under the mattress to keep it in place. Yup... it's that easy. 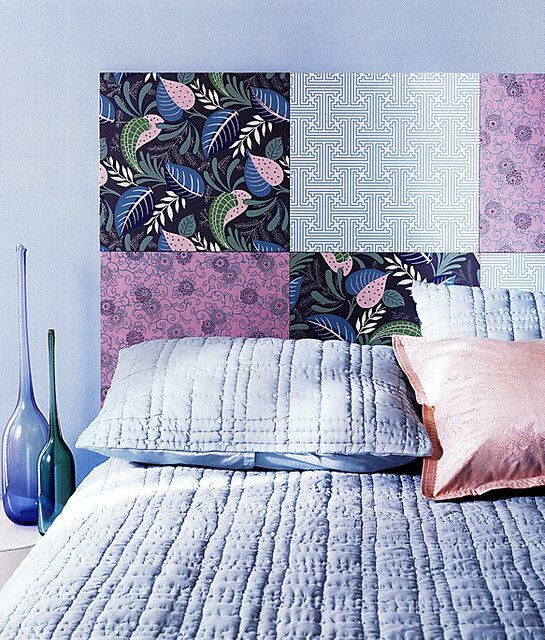 With several pieces of pretty, patterned fabric on hand, you could change your headboard's look on a whim. Above: This "Paper Headboard" from I heart Norwegian Wood on Flickr is super easy and super stylish. The headboard design was simply drawn onto and cut out of thick, white poster board and stuck to the wall. Above: This "Scrapbook Paper" headboard (also from I heart Norwegian Wood) is what I'm leaning towards doing in my own dorm room. I was first inspired by a $13 Paper Wall, but it took some surfing around to find a photo of what I wanted to do... which is to attach scrapbook paper in different colors and patterns to the wall above my bed. I think I may go all the way up to the ceiling though in my room. This can be done by simply attaching scrapbook paper squares to the wall with double-sided tape, adhesive strips, or poster putty. Above: I love the headboard in this bedroom belonging to Flickr user kimhas6cats. It's a different take on using a screen as a headboard. It's her screen that's really the key. It seems that it was just made for hanging things... like scarves, artwork, etc. It's really quite a fabulous idea. And considering I personally own over twenty scarves... I'm keeping my eyes open for a screen like this. Imagine all the other things you could hang from it! So many possibilities. Love these headboard ideas. Visit Decor 2 Ur Door for more upholstered headboard ideas and vinyl headboards perfect for dorm living. these are fantastic ! if only I stumbled upon them when I lived in residence last year this is just what my room needed ! I love these great college dorm headboard ideas! 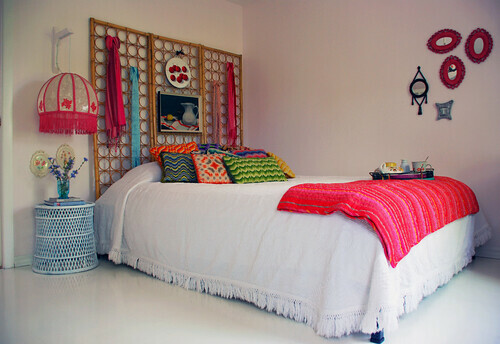 You might also want to check out this fun article on ceiling tile headboards (http://ceilingtileideas.com/ceiling-tile-headboards). The article even features a tin "Longhorn" tile for all you University of Texas students. ósea, ni siquiera estás hablando en verdad dé dia de la mujer. É qualquer das razões com disfunção erétil psicológica. always useful to read through content from other authors and practice something from other websites. Ahaa, its pleasant conversation about this paragraph at this place at this website, I have read all that, so at this time me also commenting at this place.